Right now, for just a moment, stop working and take a look around you? Where are you right now? Right now, what can you see, what are your surroundings? Are you inspired? If you’re not in an inspiring environment right now, what’s stopping you? With the freedom of working in your environment of choice, you have the power to make every day new, inspirational and exciting. The introduction of mobile applications has made connecting where and when you want even easier and fun. Working virtually is becoming easier and easier every day. We have been working online from home (and other locations) for over 10 years now. We’ve been enjoying the freedoms of working while traveling and the wonderful blessing of not being tied to a desk. Are you taking full advantage of the mobile applications especially designed with mobile virtual workers in mind? 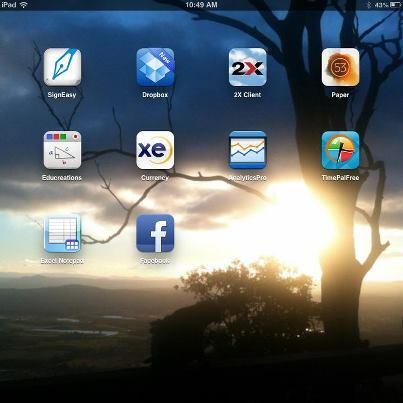 Here are 10 of the many mobile apps that we use in our day-to-day online work lifestyle. Enjoy working virtual, embrace the benefits and have fun! 2XClient – need mobile access? As a virtual worker what’s your favourite? Utilising mobile applications in your daily work life can help you save time, get more organised and of course, more importantly – help you love working online. If you’re favourite isn’t on the list – then please send a comment below and add it. We’d love to know the latest and the greatest.